I've recently posted this into another thread, but I thought I might as well make a thread about it. Regarding engine upgrading, I was wondering, it would perhaps be best to create a separate webpage dedicated to the TDM Engine, chiefly to document new features and updates that separate it from idtech4, but also to attract potential developers that can help improve it. Is there a github page for the code, or something like it? Edited by zergrush, 14 October 2013 - 05:56 AM. The engine and the mod work in lock step, this topic needs to be handled internally first so that we can get a better idea of the path forward in that regard. I have some plans on what I want to do to the engine asap, but they are pretty major and require people be happy with them. If they even go ahead at all. But yeah, first I think we'll talk it over as a team. Also the engine doesn't really have a name, and its almost certainly not 'Dark Engine', since well, that's the Thief engine name. Yeah you need to change the name of the thread or put an explanation right up front in the OP that we're talking about TDM's engine and not Thief's Dark Engine, since it's very confusing. It's true that our engine is quite different from idtech4 at this point. If you look at the sourcecode for both, I mean just the folder of files, it's blatantly obvious just by sight. So it deserves its own name. But I think in practice people would just call it the TDM Engine. Most of discussion about it is in the Developer's forum here though, since it's still in development from version to version. What it looks like you're talking about in the OP--putting up a public page on the engine--is really for branch projects separate from the team, for fans that just want to play around with it. I mean, that's what I think its value would be, since we already have people working on the engine for the next version internally. Anyway, I think that would be a valuable thing, because we all have the open-source ethos around here of share-alike. Our engine is a good engine, and it'd be a great base for all sorts of indie games, much better than most other open source engines you could start with (to say nothing of smaller possible branch projects, like "multiplayer TDM" or "TDM+Mirror's Edge 2 Moves", etc, a fan could do just for fun.) But for it to have that role, it needs some primers to get fans out there to know how the code works and how to experiment with it. Edit: That said, the code is maaasive. Such a project would be a fantastic undertaking. And I don't know how useful a basic explanation would be anyway. Nothing really beats just opening up the code & reading it oneself, and experimenting with it locally to see what happens, and then maybe asking one of our coders any questions. Something to be said for the good old fashioned way. Edit2: Also like Serpentine is saying, you have to distinguish projects you want the team to do for TDM in future versions versus projects you want to do yourself locally, just for yourself, or other fans doing it for themselves. Projects for yourself you are free to do at your leisure. And if it turns out really well, you might show it to some people & make a good case for inclusion in the mod if it really is special. But for doing things for the mod, it's a much bigger deal, because then you have to get the team involved & there has to be a lot of debate and back & forth discussion and bug fixing and you have to know when to push and when to compromise... In my experience, when you're starting off learning the code, the best thing to do is just play around with it locally for yourself and make some changes that make you happy, and once you get used to how things work, and also how the mod works, you can think about what's worth bringing to the attention of the team. Edit3: And incidentally, there are established things around already... There's a page specifically on things we might want to add to the engine now that it's open source. http://wiki.thedarkm...ch4_Open_Source Adding to that wiki page, making a thread on the forums with a request, & adding feature requests to the bug tracker (probably after vetting it in a post first) are the first places you'd probably start with requests for what we might do with the engine. I was convinced TDM's engine was named Dark Engine, because I had the impression I had read it once around here. I probably misread some post or whatever. My bad. Anyway, regardless of the internal development by the team, I don't think having a separate project page and a main branch wouldn't hurt anything at all. People are already free to fork the engine as they want it, and a page wouldn't make it a lot easier for non-team members to submit fixes and suggest improvements. Given that TDM is clearly lacking on the performance side a little, this seems like a logical step to start smoothing out some rough edges. Edited by zergrush, 14 October 2013 - 05:54 AM. Yeah sure, get some public discussion going on the side. That could be fun for fans, as long as they manage expectations. But it'd be a good learning experience for people anyway. Somebody has to do the gritty work putting up a page though, so if you're up to it then go for it! I'm not really a programmer or webdesigner, but what I would suggest to be done in a preliminary stage would be to create an official github repository. with the original GPL release. Edited by nbohr1more, 23 June 2014 - 07:20 PM. Sure there's a chance albeit slim if you counting on existing contributors. But the code is available. If someone capable wants it enough they can do it. So, Sikkpin has offered to help. if any future build of TDM goes GLSL his work would have to be converted (there are ARB to GLSL converters as I recall) then optimized. the default ambient would look nice. you'd think he'd be suited for? Maybe we should prompt him for assistance sooner rather than later before he changes his mind? Edited by nbohr1more, 01 March 2014 - 11:02 PM. In my opinion, anything brought to the table in terms of these types of improvements would hopefully be optional and not require recreating a good chunk of our resources to support them. I seem to recall some of sikk's enhancements requiring a completely different type of normal map texture to even use them. shaders which need height maps. Yes, that hard coded directional shading in JC Denton's work was "wrong" but it helped alleviate the flat look of some maps where no or few "normal" lights were used. It's hard to say if that would be a good way forward anyway since so many textures already have now had AO baked into them (which would also be tangent space based). (such work also complicates any further AO designs... so it may mean that "many" textures need to be reworked anyway for consistency). Plus if there's something else on the roadmap for AO, then such an intermediate step would be a waste of energy (etc)? 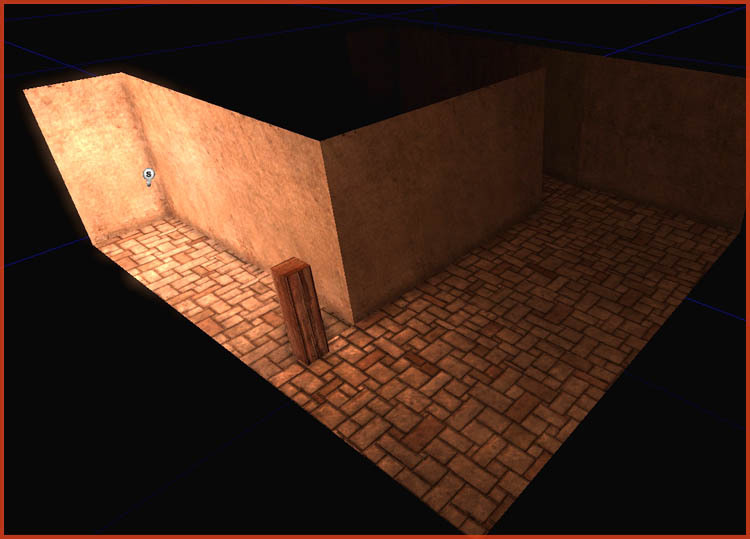 more defined shading is needed) leaving the ambient for it's sole role as a baseline ambient brightness level. Hard to say without knowing what the long term plans are. Edited by nbohr1more, 20 October 2013 - 03:30 PM. for a game character may be skinned many times per frame, simply because it is faster. was skinned only once per frame and the uniquely skinned version of the mesh was stored out to memory. and memory bandwidth was somewhat different. reading/streaming the "un-skinned" source mesh from memory. In other words, reading/streaming the "un-skinned"
an already skinned mesh from memory without performing any additional calculations. send/copy it to the GPU. In addition, far less memory is being read because while the same "un-skinned"
all parallel threads (or tasks) use the same source data (as opposed to unique source data). times per frame in DOOM 3 BFG. (very common) then the mesh may be skinned 7 times per frame in DOOM 3 BFG. to the original DOOM 3. However, DOOM 3 BFG runs noticeably faster on today's hardware. synchronization primitives like mutexes or critical sections. triangle intersection test is performed for every single shadow volume near cap triangle where the linegoes from the view origin to the light origin. (at least on the hardware that supports the depth bounds test). Edited by nbohr1more, 30 October 2013 - 11:44 AM. Does that make it usable for us? Is there a timeframe for that..? Also what news on Sikpin has he started working on any of the code..? +1, I dearly want OpenAL so we can start putting EAX / EFX into missions. and add GPU Skinning and better shadow code. to be a parent tracker for engine improvements. Yes, it's more or less a wish list but having it on record at least gives a target to point to. I tried to link child trackers to it but I don't have privileges to do this. Would these changes be compatible with the TDM engine? I don't have everything setup to build the engine anymore, otherwise I would attempt to paste those changes in and give them a run. Would be interesting to see what kind of performance bump it gave, if any. Looks like it. Relevators branch is based on vanilla. I was able to merge the changes into the source code. Beside a linker error, which I was able to fix doing a google search, everything compiles just fine and the game runs. However, what I do not understand is what these changes should actually do. I've ran Tears of St. Lucia but I don't see any difference. The term optimize sounds like the payoff is FPS boost. Check for that.